Here is a nifty App with the potential to create a change in how we dress, shop and get rid of our clothes. 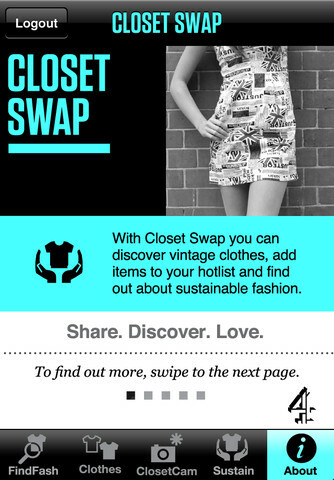 The Closet Swap, is an iPhone app that allows its users to swap and share their closet. If you’re looking to spruce up your wardrobe this year, “Closet Swap” allows you to trade some of your less desired clothes with your friends without the hassle of hosting a physical party. Whipped up by U.K.’s Channel 4, the easy-to-use tool encourages you to upload pictures, tag existing Facebook photos, and build a virtual closet for sharing and swapping with your friends. You can even telegraph a Fashion SOS from your phone, smoke-signal style, to request a pencil skirt for a last-minute job interview or snag a pair of leopard-print pumps for a wild weekend. Besides a “Fashion Finder” that helps you find vintage and secondhand stores based on your location, Closet Swap also offers talking points about sustainable and ethical fashion production and consumption. To reward frequent users, the top swappers are awarded kudos and spots on various leaderboards.